A member of Libyan security forces gestures after armed groups aligned with a U.N.-backed government took over a compound occupied by a self-declared rival prime minister in heavy fighting, in Tripoli, Libya, March 15, 2017. An interview in Russian state media Tuesday indicates that one of Libya’s rival governments is looking increasingly to Moscow as a patron, a move that’s concerning U.S. military commanders in the region. Aguila Saleh, speaker of the House of Representatives (HoR), told RIA Novosti, a Kremlin-controlled news agency, that he’s asked Russia to help train Libyan National Army fighters led by General Khalifa Haftar and has invited Russian lawmakers to visit eastern Libya. 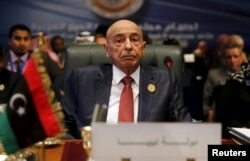 FILE - President of the Libyan House of Representatives Aguila Saleh attends the closing session of an Arab summit in Sharm el-Sheikh, in the South Sinai governorate, south of Cairo, March 29, 2015. ​His remarks come just a day after the Kremlin denied multiple reports that a team of Russian special forces and drones have been deployed to a military base in Egypt near the Libyan border -- part of a push by Moscow to support renegade military commander Haftar, U.S. military commanders think. The Libyan National Army (LNA) is loyal to the HoR, but Haftar is an independent-minded commander who doesn't always see eye-to-eye with HoR politicians. According to Saleh, the Kremlin has promised to treat wounded LNA soldiers in Russia. He disclosed that a delegation from the HoR will visit Moscow shortly. The HoR has withheld support from the U.N.-brokered and internationally recognized Government of National Accord (GNA) in Tripoli. The Reuters news agency, citing both Egyptian and U.S. officials, reported Monday that that a 22-member Russian special force unit had been deployed to the Egyptian airbase Sidi Barrani, 100 kilometers from the Libyan border. Egyptian officials also denied the claims. “There is no foreign soldier from any foreign country on Egyptian soil,” Egyptian army spokesman Tamer Al-Rifai said. 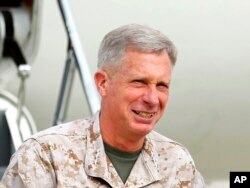 Saleh’s interview, though, will add to the alarm of U.S. military commanders. General Haftar toured a Russian warship in January and held talks with Russian Foreign Minister Sergei Lavrov in Moscow in November. Analysts say Russia appears to playing all sides in the conflict in Libya. Earlier this month, the prime minister of the GNA, Fayez al-Sarraj, held talks with Russian officials in Moscow. “While it's too early to tell if Russia has chosen sides in the ongoing Libyan conflict, it is clear that Moscow has decided to expand its stake there,” said Ilan Berman, vice president of the American Foreign Policy Council, a Washington-based think tank. “Just as importantly, it's evident that the various political parties have begun to view the Kremlin as a key power broker - and have begun to act accordingly," Berman told VOA. Lia Quartapelle, an Italian lawmaker and member of the foreign affairs committee in Italy’s parliament, said she thinks Moscow is looking to cement a role in Libya ahead of any policy shift toward Libya by U.S. President Donald Trump. Italian politicians say Russia’s mounting interest in Libya appears be part of a larger bid to rekindle Soviet-era influence in the Middle East and North Africa. Five years after Libyan strongman Moammar Gadhafi, who oversaw a four-decade-long republic of fear, was ousted in a NATO-backed popular uprising, three governments are still embroiled in a deadly competition for power in the North African country. Last year, with the backing of Western powers, the U.N. oversaw the formation of the Tripoli-based GNA. But two rump parliaments, a mainly Islamist dominated General National Congress in Tripoli, and the HoR, which backs General Haftar, have withheld support from the GNA. The high revolutionary hopes of 2012 have been dashed as the country struggles with militia and crime-based violence, the rise of an Islamic State affiliate and sharp ideological and regional divisions. This week, violence intensified in the Libyan capital, where the children’s ward of Tripoli’s Hadba Hospital was hit by a missile and clashes escalated near the Rixos Hotel between local armed groups and militias from the powerful town of Misrata, who have occupied part of the city. On Tuesday, rocket-propelled grenades struck a high-rise office building as well as the Marriott Hotel in a business district. Key junctions in the city have been blocked by barricades, say residents. In February a bleak assessment by European border officials of the turmoil in Libya cast doubt on the prospects for European Union efforts to work more closely with authorities in the strife-torn country to curb migration flows across the Mediterranean. The report by officials with the EU Border Assistance Mission in Libya painted a grim picture of factional dysfunction and chaos within Libyan law enforcement bodies and its ministries, which are barely operating. “Due to the absence of a functioning national government, genuine and legitimate state structures are difficult to identify, in particular, given the dynamic and ever-changing landscape of loyalties,” the officials said in their 56-page report, which was leaked to the website statewatch.org. EU governments and the United States have urged General Haftar to hand back the ports of Ras Lanuf and al-Sidra, two of Libya’s main oil terminals, which his forces captured recently. In a joint statement they expressed “strong concern regarding violence in the oil crescent,” adding that the oil facilities “belong to the Libyan people and must remain under the exclusive control” of central authorities.